While I was in Shanghai, I stumbled across a series oftranslated Chinese fiction, headlined as Stories by Contemporary Writers from Shanghai and published jointly by Better Link Press (New York) and Shanghai Press and Publishing Development Company. The editor of the series is Wang Jiren. His Foreword stated that the series comprises writers who are immigrants to Shanghai, but most were born in the city from a period encompassing the late 1940s to the 1980s, and includes well-known writers such as Wang Anyi, Xiao Bai and Sun Ganlu, but also features young emerging writers such as Zhang Yiwei, whose short story collection, Labyrinth of the Past (2015) is reviewed here. From age 5 to 22, Zhang Yiwei grew up in Tianlin, a neighbourhood in Xuhui District, southwest Shanghai. The seven bittersweet nostalgic stories in this collection describe a childhood in Tianlin and the bordering town of Xiaozha that were undergoing rapid transformation and industrialisation in the '80s, from farmlands to organised apartment complexes for factory workers. This changing landscape evokes the lives of Chinese workers, tinged sometimes with desolation, anonymity, and a deep sense of loss. 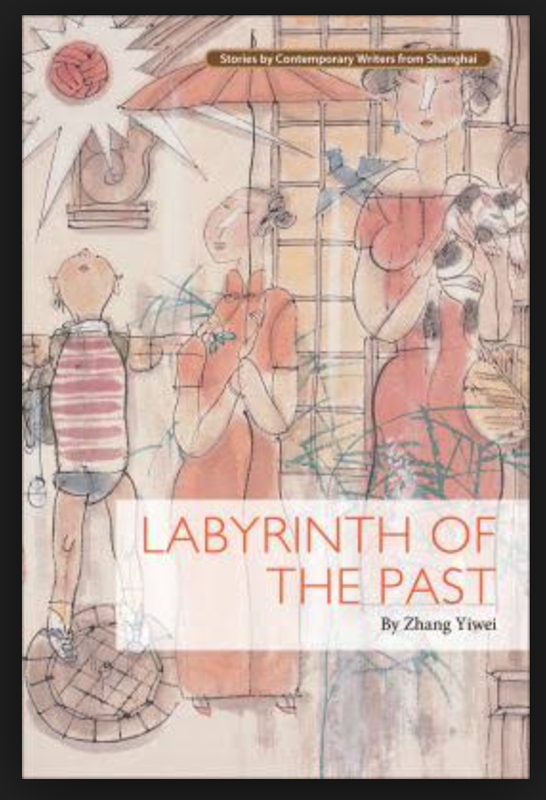 Zhang Yiwei’s collection is particularly noteworthy for its observation of details both past and current, and for its angle of approach – these are stories about young women of the ‘80s and ‘90s growing up raised by single mothers. The broken family connections echo the breaking up of landscape, all in the name of progress, but the stories seem to whisper: at what cost? There were many dilapidated buildings and country folks in the town, and we could see the chicken, ducks and geese they raised, and ferocious black dogs. The buildings were bare and on the verge of collapsing, since most of them were illegally built, the inside of which was impossibly twisted, rundown and filthy. Even in the late 1990s, there were still people cooking over a simple coal stove and making a living from it. It comes as no surprise that issues of class would thread through these stories. A Good Year, for example, is a story about a young woman Qingqing bringing home her boyfriend and the discussions surrounding the Chinese custom of dowry that a girl brings with her in marriage. For me, the fulcrum of the story pivots on what Zhuoran says to Qingqing immediately upon being invited to come home with her for dinner. “Qingqing, if you don’t have the money, I can give it to you. Just say that your mom gave it to me. That way my mom would feel better. If she feels that she has been given face, maybe she will like you better.” Did he really expect her to say yes, or to be grateful for his magnanimity? This is fundamentally a story about the Chinese concept of 'face', particularly within in-law connections, the extended family. The story’s plot points chart different ‘transactions’ of such nature where the weight of in-law relationships is given monetary value. Zhang Yiwei weaves into this story another interesting aspect: Qingqing’s mother works in a photographic studio, and collects pictures no bigger than a fingernail in albums, noting the time, place, photographer, and the style and color of clothes, as if she were marking her place in time. The photographs though also function as documentary record of changing times and spaces and their oscillating values, sentimental and otherwise. And yet, how interesting that for all her collecting, there's not a single photograph of Qingqing displayed in the family home, only pictures of her mother in her young days. …Mom would pull from around the waist crimson and stiff cotton balls and tell Puyue that a woman would bleed copiously in her pants when unhappy, and the hardened blood would stick to the softest skin causing the skin to bleed at the slightest touch, and one couldn’t tell if the blood was real blood or unhappiness that had bled out. This auratic voice of being Chinese and yet not completely contained within this identity comes across well in the translation, which does not resort even once to pinyin, putting to shame many novels written in English but set in China that would sprinkle pinyin phrases prosaically throughout in order to up the authenticity quotient. Occasionally, as in the story No Choosing Today, where a young girl finds herself caught in between the affection and crosshairs of a divorced father and mother, the system of reward and punishment in a Chinese elementary school isn’t as easily navigable, and the significance of getting to touch, not the flag, but the rope that raises the flag escapes me. Memory holds the present accountable, it seems, in the last, longest and most poignant story in the collection, I Really Don’t Want to Come. 18-year-old protagonist Luo Qingqing describes the arduousness of the ritual of ancestral worship she’s forced to attend every New Year as a result of her grandfather’s death around this time just before her first big birthday, her tenth. It mirrors Zhang Yiwei’s own loss of her grandfather. The roles of ‘being daughter’, ‘being granddaughter’ become restraints of kinship not easily shaken off, and here too, Zhang explores poignantly the psychic trauma of being a child caught within familial bonds and her parents’ divorce. NB: Labyrinth of the Past is published by Better Link Press (2015) and is available from Amazon. The contemporary voices column picks up noteworthy short story collections within the last three years worthy of renewed focus.